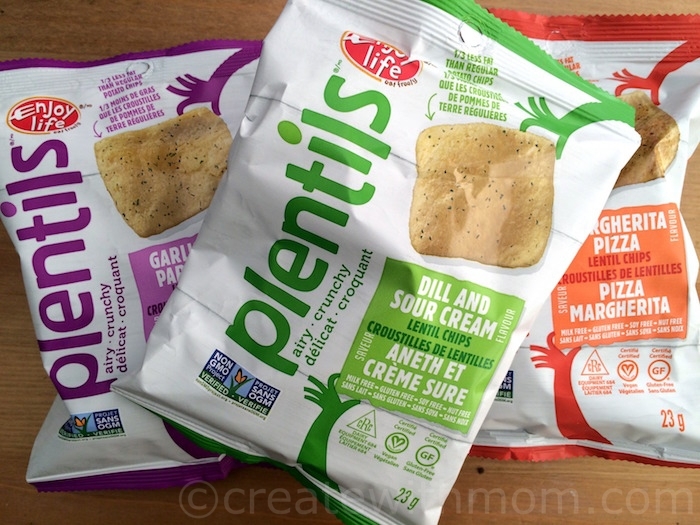 My family and I enjoyed the Plentils, lentil chips. The flavourful chips are available in a variety of flavours such as Garlic and Parmesan, Dill and Sour Cream, and Margherita Pizza. We like that this plant based chips are made with lentils. The seasoning is flavourful, and the chips are crunchy and airy. 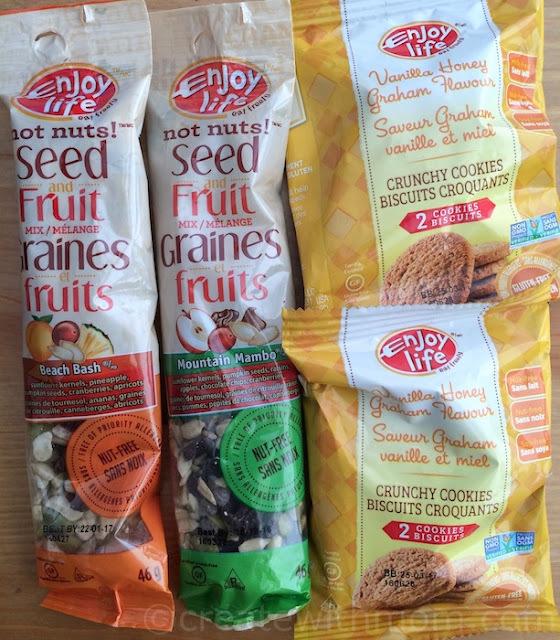 Enjoy Life cookies are addictive and delicious. We enjoyed the crispy, crunchy taste of Chocolate Chip and Double Chocolate cookies that are tasty without being overly sweet. 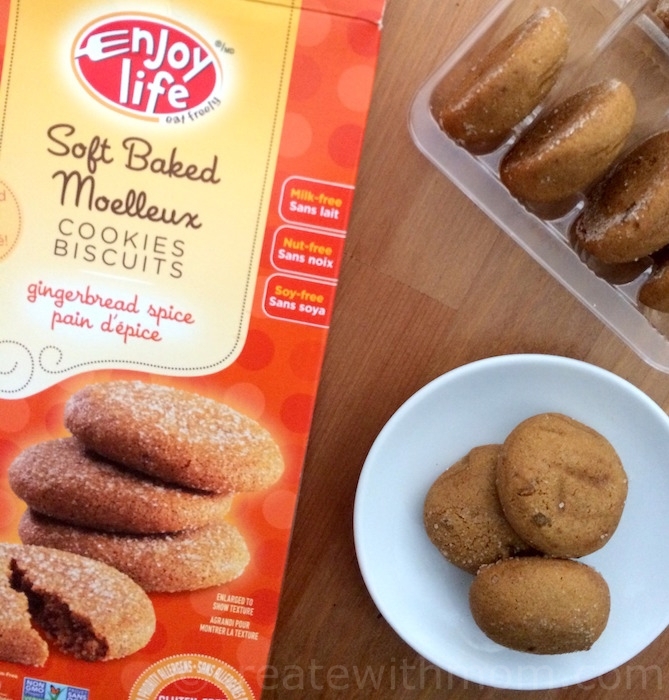 The soft baked cookies with gingerbread spice is our favourite. It is soft, and melts in the mouth. We like the aromatic smell and flavour from the different spices that make these cookies a special treat. They also have delicious vanilla honey graham cookies. We enjoyed snacking on the Seed and Fruit mix. We didn't miss the nuts in this delicious mix with sunflower seeds and dried fruit. Enjoy life also has a variety of mix packages for which we have to add oil and water to prepare and bake. I found the instructions easy to follow to make pancakes, muffins, pizza, and more. Using the pizza mix I made two 10" pizza crusts. I like that I didn't have to wait for the dough to double, I was able to knead and bake the crust right away. 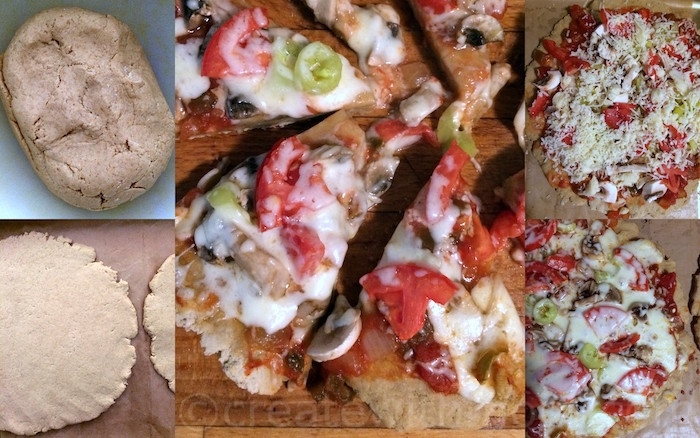 We found the pizza tastes better if we enjoy it right away. We enjoyed baking brownies using the brownie mix. The mix is made with gluten free flour such as Teff. With this package we can bake fourteen brownies. The baking time is between 30 to 40 minutes. We felt the brownies tasted floury and has a heavy flavour that stays a while on our palate. The gluten free chocolates bars made without any artificial ingredients taste fabulous. These chocolates will be enjoyed by everyone. I like having ingredients that we can read and know what they are, so we were happy with all the Enjoy Life products that are a better alternative for our health. All their products are made in a dedicated nut and gluten free bakery in Illinois, USA. The products are available in national and conventional grocers and mass market retailers throughout Canada. Enjoy Life's mission and brand promise is to deliver safe, better-for-you products Free-From the priority allergens, but not Free-From taste, so everyone can Enjoy Life and eat freely. If you live in Canada and would like to win a prize pack with a variety of Enjoy Life products value of $75 before October 28 enter the giveaway through the rafflecopter below. Please leave comments and follow my social media networks to be eligible to win. I live in Ontario - I like Enjoy Life products, from what I have tried; I would like to try more! I am in Newfoundland Canada. I would love to win to try these. :) Never have before. Thanks! 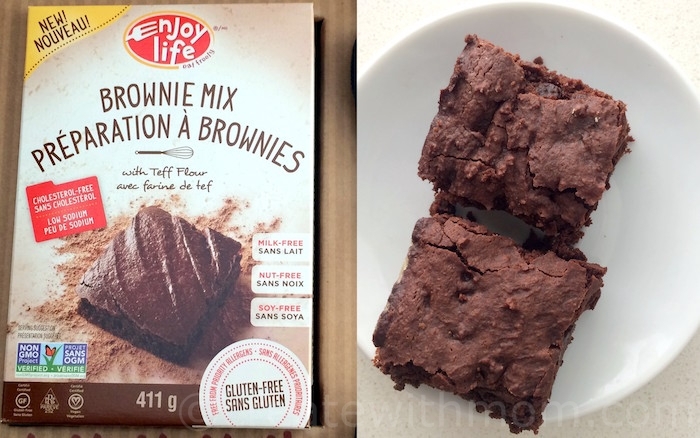 I live in BC and I'd love to try these products as we are trying to eat less gluten! I live in Ontario. 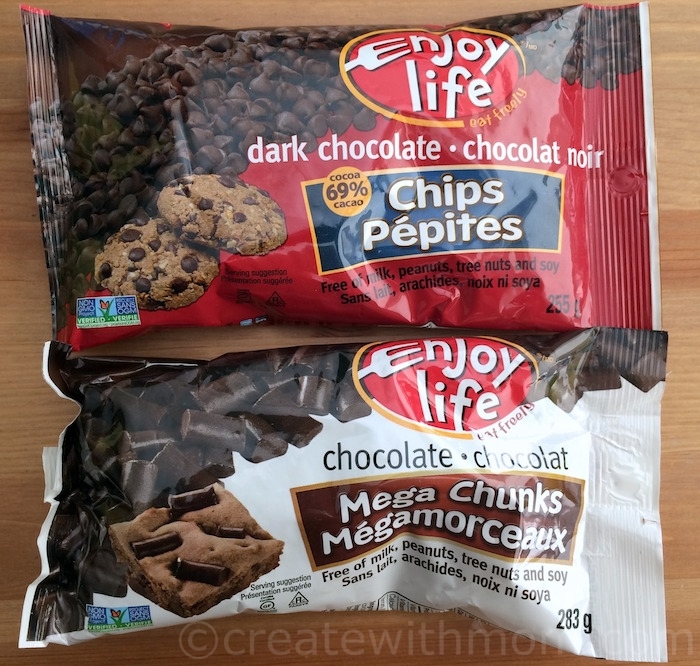 I'd love to win because we are a gluten-free household and have tried some of these products (I buy the chocolate chips a lot) and would love to try the others. I live in London Ont and would love to win because I am always looking for safe snacks for Miss R to take to school. I live in Ontario and i am trying to living a healthier life. Going gluten free is one way. Thank you. I live in Manitoba and would love to win this because i love these products and it would be nice to have some free ones! I live in BC and I would like to win b/c there are some items I would like to try, especially the chocolate! I live in Saskatchewan and I would like to win because they are gluten free products that taste good. I live in Ontario and I'd love to win because I've never tried this brand before and I'd like to. I am always on the lookout for new things to try! I live in Ontario. I'd like to win because these products sound delicious and I'd love to try them. I live in BC and I'd like to win as my sister who is allergic to sulfates and gluten is visiting soon. I live in Ontario, and I'd love to win this because I have Celiac and my wife has several food allergies. It's tough to find things we can both enjoy! I live in BC and I would love to win this for my kids - some healthy treats for them to try! I live in Nova Scotia, I would like to win because these sound tasty and I have never tried them. I live in Ontario and have never seen these products but would love to try them! I live in Ontario and want to try anything that healther for us to eat. I live in NL. I have tried some of their products and would love to try more of them. I live in Ontario.I would like to try these gluten free products for a healthier take on life. I live in Fergus Ontario. I want to win this so I can donate 1/2 to the food bank. I live in Ontario. I'd love to win because my daughter has a peanut allergy! I live in Ontario, I would like to win because I love trying new products and I think these would be a huge hit! I live in Ontario and would LOVE to win the Enjoy Life prize pack for my grandson, we're always looking for healthy snacks for him to take to school for his lunch & snack time. I live in NS and I think it would be very tasty. I live in Canada. I`d love to win because I love trying new foods. These all sound fantastic. I am in British Columbia, and I would like to win this prize back because I am thinking about going gluten free and this would be a great introductory package. I'm in Southwestern Ontario and I would like to win this because it's baking season around here. I live in ON, and I'd love to win to try some new delicious snacks! I live in Nova Scotia and would love to win cause their products look super yummy!! I'm in Ontario and I would like to win because I've never tried Enjoy Life Foods and it's baking season! Thanks for the chance. I live in Ontario and would like to win to try these products. I live in Alberta. My family would love the products in in this Enjoy Life Pack! I would like to win this for my sister-in-law as she has crohn's and must eat gluten free foods. I am in BC. Would love to win to try the products! I am in BC. Haven't tried this brand but would like to. I am in BC. I'd love to try the brownie mix. I live in Ontario and I would love to win the enjoy life prize back because we love to bake during the holidays!! I love having sweets for guests when they visit and to bring with us when we visit people! I live in Ontario and I would like to win because I haven't tried these prpducts yet. I'm in Ontario - I have seen some of these products in my local stores, but hesitant to part with $ if I'm not sure we'll like them. I live in Nova Scotia. I'd like to win this pack so I can bake treats for my gluten-free friends. I live in BC and would love to win this prize pack because the food sounds healthy AND delicious - just the kind of combo I want and need!! I"m in BC. 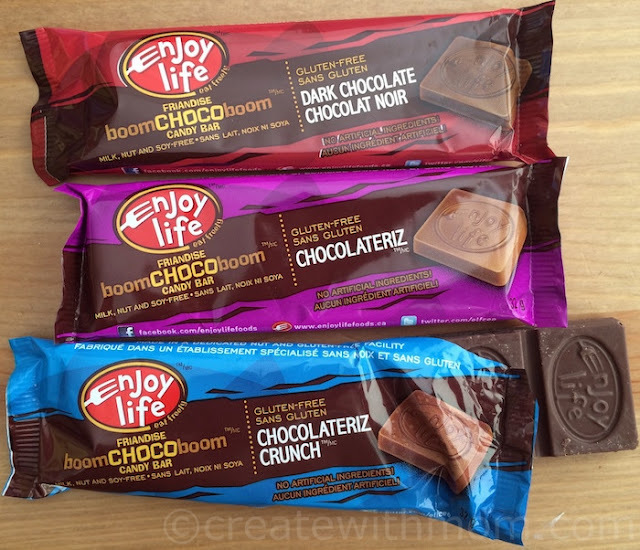 I would love to win this prize pack because I have heard of Enjoy life, but have yet to try it. This would be a great chance try a variety of their goods. I live in Saskatchewan. My wife has some food allergies so this would be great to win! Thanks. I live in BC and I would love to try these products because it is healthy and it looks yum. I am in Ontario. I have always wanted to try Enjoy Life products, so this would be a great prize pack for me. I live in Southern Ontario not far from Sauble Beach in fact. I'l love to try this assortment since I'm newly gluten-free always on the lookout for new food options. I live in Ontario. I'd love to win for the opportunity to try some great new products! I am from Ontario and I love to bake. These products are perfect when making treats for my daughters class as there are kids with allergies. I live in NB and would like to try these products as we have food allergies/intolerances in our family. I'm in New Brunswick, and I love to try and share new healthy things with my family. I live in Ontario and I'd like to win this Enjoy Life prize pack because I've tried their Plentils and would love to try more of their products. I live in Ontario. I would love to win this prize pack because I am trying to eliminate gluten from my diet but would still like some treats. I live in Newfoundland. 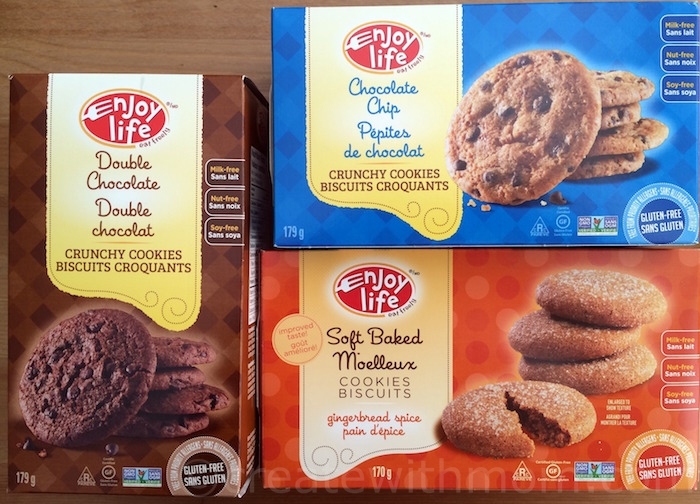 I want to win this Enjoy Life prize pack because they have really good products,i love their cookies. 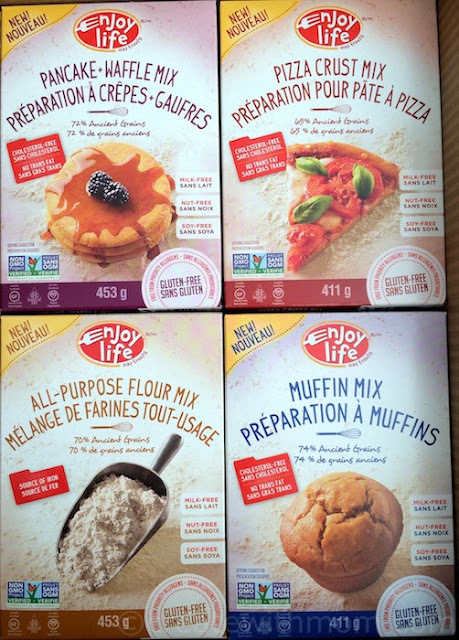 I live in Ontario and I would really love to win this Enjoy Life prize pack because I suffer from nut allergies and I am a Celiac. I live in BC! I would love to win this prize pack because my daughter has an intolerance and I'd love to give all these products a try! I'm in BC, and I'd love to win this prize pack because we are trying to go gluten free, and these would great snacks for our little one.